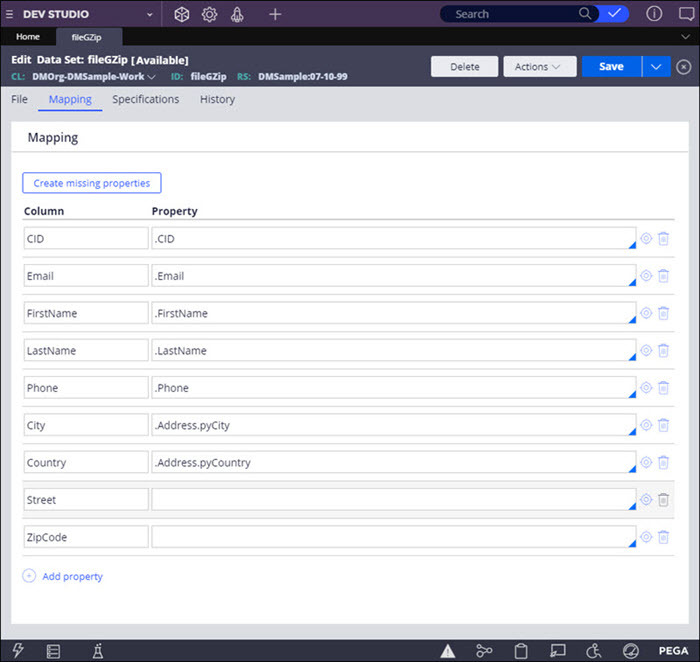 To use data stored in cloud-based storage systems such as JFrog Artifactory, Amazon S3, or Microsoft Azure in your Pega Platform™ applications, configure a remote repository as a data source for a File data set. 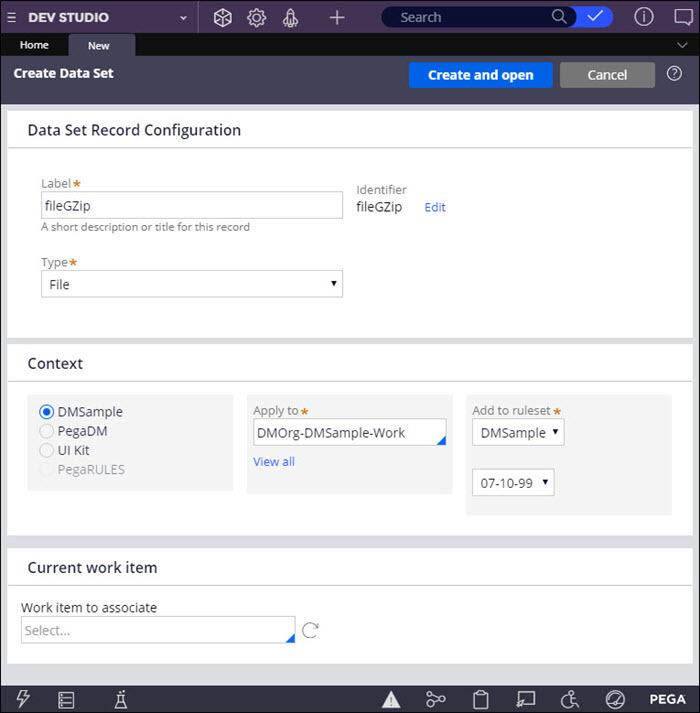 You can apply this functionality to set an automated data transfer to Pega Platform in the cloud by enabling parallel loads from CSV and JSON files that are stored remotely, instead of creating and maintaining relational databases to transfer remote files. You can then convert and use the transferred data in various scenarios, such as in a marketing strategy or for customized correspondence. After you create a File data set with a remote repository, you add a reference to the File data set in a data flow. 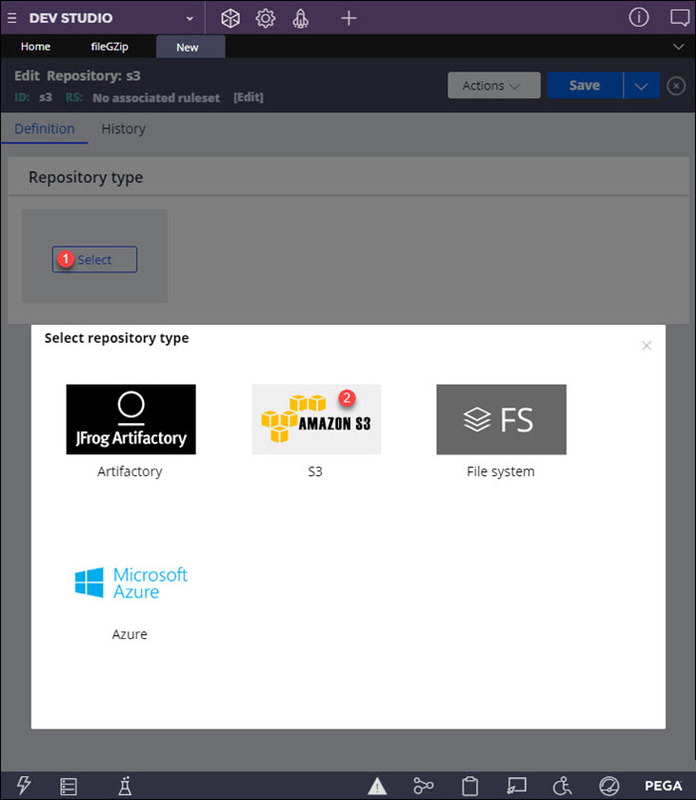 See Referencing remote repository data in a data flow. The marketing team of the Xauto company wants to use their client data, which is stored in Amazon S3, in their decision strategy on Pega Platform in the cloud. To use data that is stored in a remote repository, such as Amazon S3, create a File data set that references that directory. In the Type field, select File. In the Context section, select the Apply to class and ruleset version. Confirm the settings by clicking Create and open. In the New tab, in the Data source section, click Files on repositories. In the Edit Repository tab, click Select and select S3 as your repository type. In the Authentication profile field, select or create an authentication profile to connect to the repository. For more information, see Creating an authentication profile. To use an Amazon Key Management Service (KMS)keystore for storing keys and certificates, select the Server side data encryption with KMS managed keys check box and enter the KMS key ID. For more information, see Keystores. Verify the credentials by clicking Test connectivity. 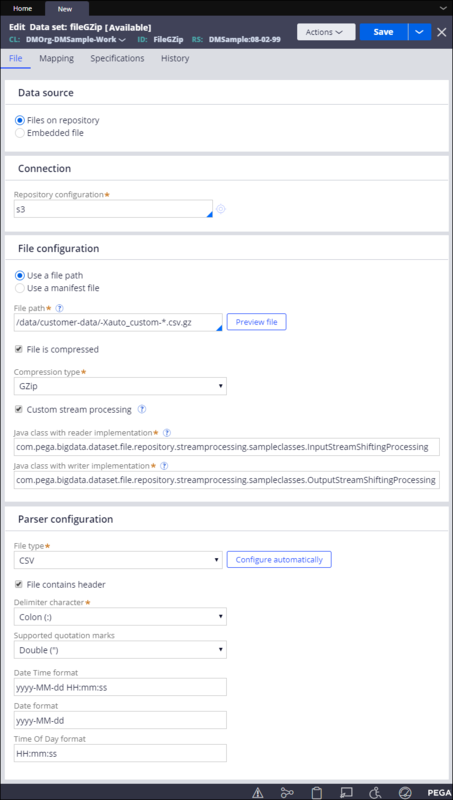 For more information about the custom stream processing interface, see Requirements for custom stream processing. Optional: To preview the file based on the settings from the File Configuration section, click Preview file. Time properties in the selected file can be in a different time zone than the time zone that is used by Pega Platform. To avoid confusion, specify the time zone in the time properties of the file, and use the appropriate pattern in the settings. To add a new column, click Add mapping. To remove a column and the associated property mapping, click the Delete mapping icon for the applicable row. To map an existing property to a CSV file column, in the Property column, press the Down Arrow key and select the applicable item from the list. For CSV files with a header row, to automatically create properties that are not in Pega Platform and to map them to CSV file columns, click Create missing properties. Confirm the additional mapping by clicking Create. To manually create properties that are not in Pega Platform and to map them to CSV file columns, in the Propertycolumn, enter a property name that matches the Column entry, click the Open icon and configure the new property. For more information, see Creating a property. For CSV files with a header, the Column entry in a new mapping instance must match the column name in the file. Confirm the data set settings by clicking Save. Add a reference to your File data set in the Source shape of a data flow. 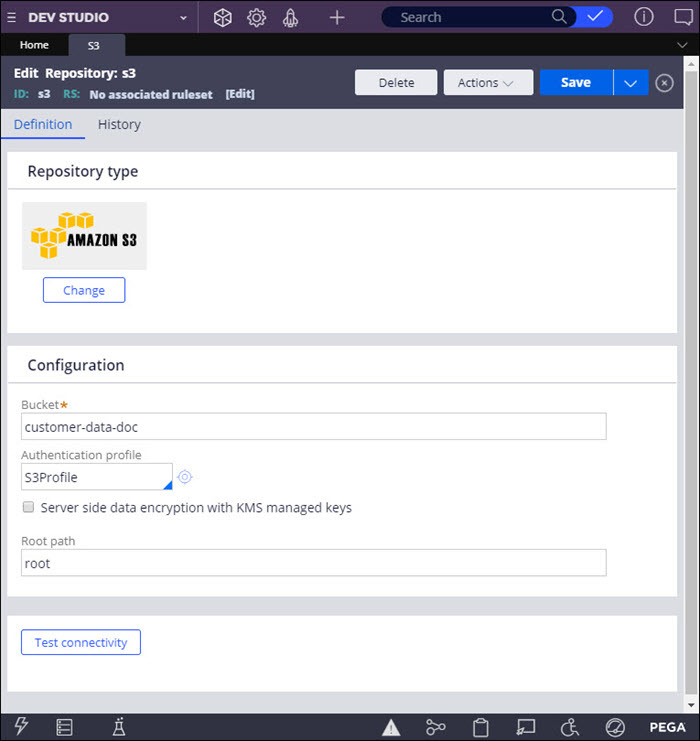 See Referencing remote repository data in a data flow.